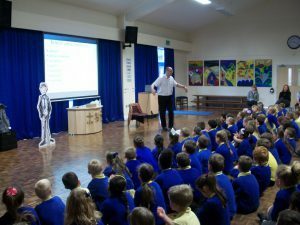 I had a fantastic time at Lowton St Mary’s and was fortunate enough to meet many of the pupils during my first morning in school. The visit began with an author assembly. Year 2 to 6 listened really well as I squeezed the last three years into forty minutes, starting with the first hand-written drafts of Impossible Tales through to the latest book. I showed the children lots of manuscripts and made a point of highlighting how important editing is. The children saw Martin’s illustrations in the various stages of development and I even managed to fit in a performance of one of the Tales. Phew! A cracking start to the day. After catching my breath, I joined Year 5 for a writing session. We looked at one of my unpublished pieces of writing about a particularly nasty character and I challenged the pupils to create their own version. They generated lots of fab ideas and, after lots of whole-class and peer discussion, planned out their writing. I managed to listen to a couple of first drafts before I left and I was impressed! The final stop of the morning was with Year 6. Again, we tried to create a really nasty character and the creativity on show was a joy to behold. In fact, some of the ideas made me a little scared! We looked at ‘showing not telling’ and the children demonstrated their grasp of the concept in some of the sentences they produced. 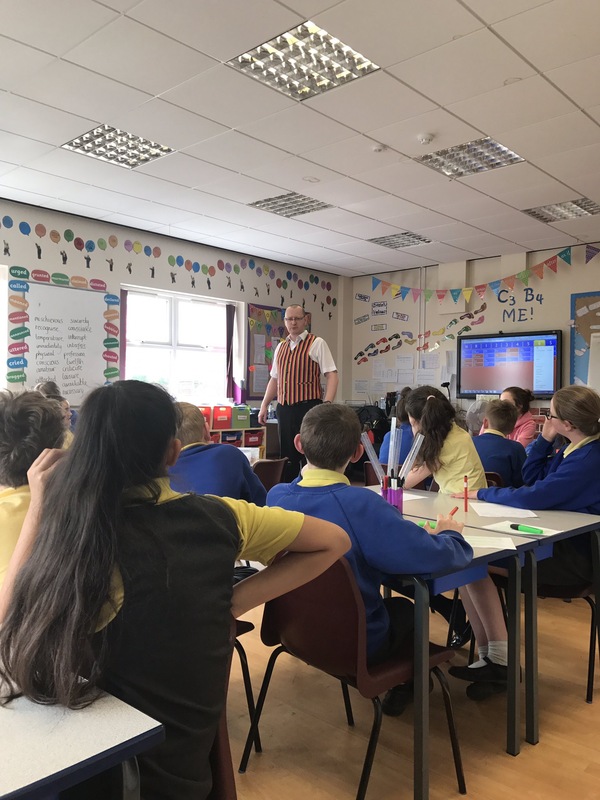 The session concluded as I handed over my storytelling waistcoat to the pupils so they could share some of their super sentences in front of the class. I’ve got a sneaky feeling the descriptive writing they complete with their class teacher will be impressive. To finish off a busy morning, I signed books and chatted with some of the pupils during the lunch break. It was lovely. Big thanks go to Mr Sherriff, the headteacher, for inviting me. I had a cracking time at Lowton St Mary’s and I’m already excited about returning in May to work with more of the fabulous pupils.